the flame of courage blazes in our heart. we will fight victoriously in our citadel. we will fight for the sake of our comrades. Live on eternally with the spirit of a lion. The Gajokai song was first presented in June 1999. The melody was composed by Tomohiko Nishimura and the lyrics were written by representatives of Gajokai. The lyrics depict Gajokai as having the honour, the justice and the wise in vigilantly safeguarding the citadels of the law for kosen-rufu. The Gajokai was established on 1 February 1971 as a group to train youthful champions of Soka who will protect the Soka Gakkai Headquarters as well as community and culture centres around Japan. Around that time, news spread to members throughout the country that the Gajokai, a new group for safeguarding Soka Gakkai facilities had been established. The Young Men Division members who were engaged in this activity, became Gajokai members from 1 February, marking that day as the effective day on which the group was established. At a Vice Presidents conference held in June 1976, dates were chosen to commemorate each of the function and cultural groups within the youth division and 1 September was selected as Gajokai Day. Incidentally, it was the day of the completion ceremony of the new Soka Gakkai Headquarters in Shinanomachi, Tokyo when the old mortared-frame building was replaced with a new reinforced-concrete structure in 1963. 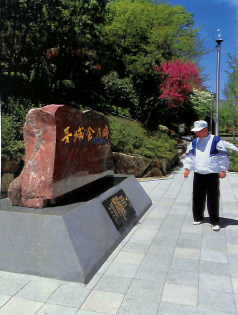 Ikeda Sensei thought that this day would be most appropriate to commemorate the Gajokai, which safeguarded the headquarters and protected the Soka Gakkai. In the past, Ikeda Sensei had discussed the term with his mentor, Toda Sensei, and he had continued to treasure that conversation in his heart. Gold badges were also created to present to Gajokai members, with a design employing the letter ― G, which is the first letter in the words Gakkai, Gajokai and gengo, which means to “vigilant safeguard”. Gengo is a word that appears in Buddhist sutras, in the phrase “vigilantly safeguarding” the citadel of the Law. The spirit of the Gajokai is to vigilantly safeguard, in the spirit of not begrudging one’s life, the citadels of the Law for kosen-rufu — the Soka Gakkai Headquarters and facilities — and the organization and all of its members. In the song, the first verse of the lyrics depicts these youthful champions of Soka fighting victoriously to keep their flame of courage blazing in their heart whether in days of spring or nights of storm. The second verse depicts that whenever these crowned champions are called upon to safeguard the fortress and its precious members, they perform it with honour and gather with joyous smiles. The third verse depicts that right now and here is where the youth with a noble mission calls forth the spirit of a lion and live on with this spirit for eternity. to become a leader of leaders. Protect our friends, and fellow members! Protect the respectworthy people, the Bodhisattvas of the Earth! This is also the credo of the Soka Group, who strives to ensure the safe and smooth conduct of Gakkai activities, uphold by the Gajokai as one of the two core groups of the Young Men Division.